Our events last from 1 day to a week. On most multi-day events you are welcome to join us for a day or part of the event, typically costing from £69 per day. 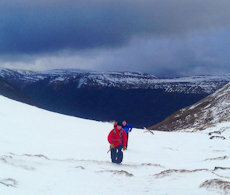 A Navigation Skills day based in the heather clad hills above Pitlochry and around Ben Vrackie. 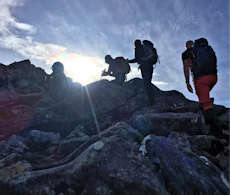 Join us for a day and gain the skills needed to plan hill-days and navigate with confidence on Scotland's mountainous terrain. 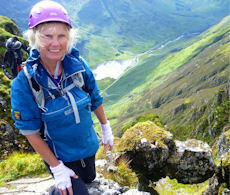 Easy hillwalking on paths and heather-clad gentle slopes learning new skills ! The grand and complex cliffs and buttresses of Bidean nam Bian and Stob Coire Sgreamhach tower over Glencoe. 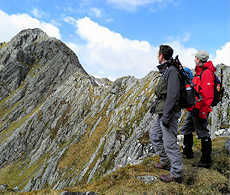 We are here for a day's adventure exploring this impressive mountain and bagging its 2 Munro summits. High above Royal Deeside, Lochnagar with its vast cliffs looks down into dark corries and deep lochans. This peak is the dominant mountain in a superb high-level area which boasts 5 Munros which we'll aim to bag over a summer day. We're biking, backpacking and hiking into Alder Forest over 3 days. From our camp, we'll be bagging all 6 Munros in the area, including Ben Alder, Beinn Eibhinn and Geal Charn. 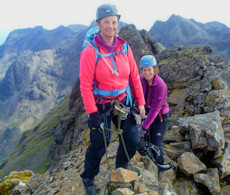 Over 4 days we are hiking, rock-scrambling and enjoying a bit of easy climbing to reach the summits of all the Munros on the Black Cuillin of Skye. 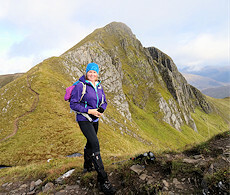 A walk and rock-scramble along the spectacular Aonach Eagach ridge above Glencoe, bagging two the Munro peaks. Ideal preparation for the Skye Munros ! Two days of guided hiking into remote areas and up rugged terrain to reach high crests and ridges east of fjord-like Glen Etive. 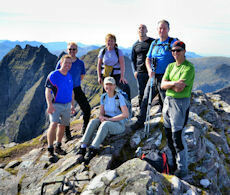 We'll aim to bag 5 Munros including mighty Ben Starav and Stob Coir'an Albannaich. Hidden behind the impressive peaks of Glencoe, peace can be found on less frequented mountains. We're here to bag the twins of Beinn Fhionnlaidh (Finlay's hill) and Sgor na h-Ulaidh, with the option of cycling in on fine forestry tracks. We're avoiding the crowds on Ben Nevis's 'tourist route' by taking the finest summer rock-scrambling route to reach Britain's highest peak and possibly returning via Carn Mor Dearg and its narrow and stunning arête. A day hiking and scrambling up two rough Munros in the North-West Highlands via less-trodden routes and interesting ridges. A fabulous day to tag onto An Teallach or Suilven ! An Teallach's crests, pinnacles and dark corries dominate its surrounding landscape. 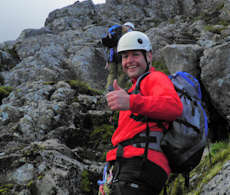 We're rock-scrambling along the 'Classic Traverse', taking in two Munros on the way. We're in the North-West Highlands heading up Suilven, the 'Sugar Loaf' mountain. This most westerly peak in Assynt has some stunning views with some easy scrambling to gain its summit peaks ! The Torridon Giants are impressive mountains in the North-West Highlands. 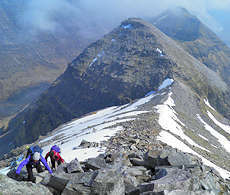 Over three days we'll be taking in the finest peaks - Beinn Alligin, Beinn Eighe and Liathach - exploring their ridges and crests, all while developing rock-scrambling techniques and skills. 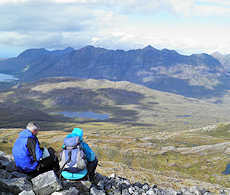 We're in the remote Fisherfield and Letterewe wilderness for a wonderful 4 days leisurely guided hiking, backpacking and camping trip in north-west Scotland. 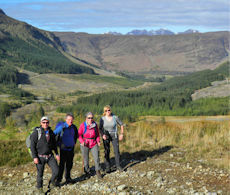 Hill-walking days along fine ridges and mountain crests above Glen Nevis and Loch Leven. 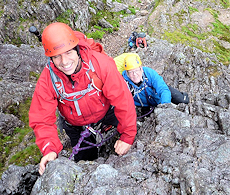 On the way we'll enjoy some superb rock-scrambling on the 'Devil's Ridge' and the famed Ring o'Steall. Three days in Glen Shiel and the Glen Elg peninsula. 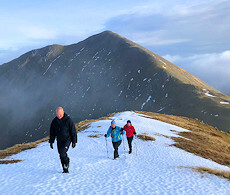 We're tackling the spine of the Forcan Ridge, multi-Munro bagging along the South Glen Shiel ridge and hiking up fabulous Beinn Sgritheall. 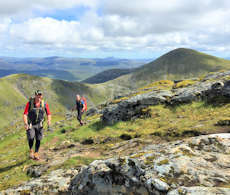 A Navigation Skills day based in the rolling Pentland Hills, just south of Edinburgh. 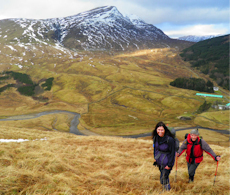 Gain the basic skills needed to plan hill-days and navigate with confidence on Scotland's mountainous terrain. Easy hillwalking on paths and grassy gentle slopes learning new skills ! We're climbing and scrambling up 'Tower Ridge' on Ben Nevis, probably the most renouned climber's route on the mountain's North Face. The exposure is sensational as we move across the narrow crests. Narrow ridges, some loose rock, great sense of exposure ! Spend 2 days with us exploring the high mountains and Munros encircling remote Loch Mullardoch in the north-west Highlands. We'll travel in by boat ! Tucked away from roads and civilisation, remote Affric Hostel is surrounded by magnificent scenery. We're here for a blissful 2 night stay and 3 days hiking over ridges and mountains that tower high above. We're hiking on superb high-level ridges, over quartzite rocks and pavements to reach superb viewpoints in the Central Highlands. 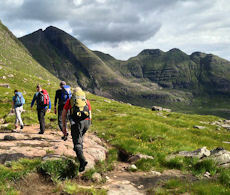 Over 3 days we're bagging 8 Munros ! 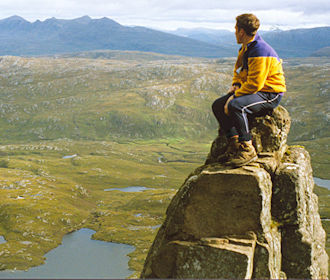 We're in the Sutherland and Assynt in the north-western Highlands, hiking up the most northerly Munros. 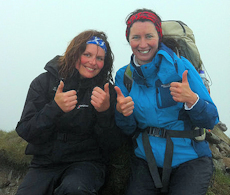 Over 2 days, the summits of Ben Hope, Ben Klibreck, Ben More Assynt and Conival are our goals. We may even try to tag in Ben Loyal ! 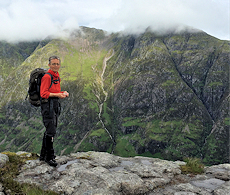 Some superb summer hiking and easy rock-scrambling as we make our way across the highest peaks in the West and Central Highlands, all above 4,000ft - Ben Nevis, Carn Mor Dearg, Aonach Beag and Aonach Mor. In the north-west highlands, the Fannichs form a long chain of peaks. 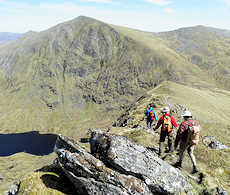 Over three days, we're hiking along mountain ridges above dark coires, bagging 9 Munro summits. 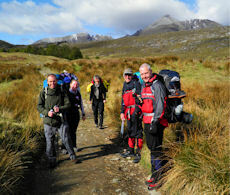 Guided hillwalking and rock-scrambling day on Liathach in Torridon where we'll aim to bag the Munros Spidean a'Choire Leith and Mullach an Rathain. 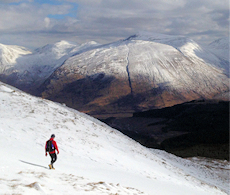 The Forcan Ridge rises dramatically above the western end of Glen Shiel and leads to the summit of The Saddle. Combined with its neighbour Sgurr na Sgine, a superb and challenging day can by enjoyed rock-scrambling and hiking along the crests. Fine approach paths leading to varied terrain and easy rock-scrambling. We're heading over water to some of Scotland's finest scenery while staying at a comfortable bunkhouse in the heart of a vibrant community. 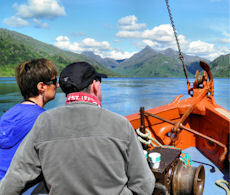 Includes boat from Mallaig and 3 nights accomodation in Knoydart Foundation. With its summit sitting above dramatic Coire Gaothach, Ben Lui is a spectacular mountain in the Southern Highlands. We're hiking up this peak and some neighbouring Munros over a long summer day. Including Ben Lawers, the 10th highest muntain in the UK, there are 7 Munros summts above Loch Tay that form a continous chain of peaks. This makes for a superb day out ! 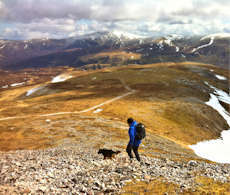 Not as daunting as it first sounds and an excellent introduction to multi-Munro bagging ! The dramatic north-west of Scotland is pitted with shimmering lochans and isolated mountains, hiding secrets well out of view. We're here in Inverlael and Freevater, striking out from Ullapool on a Munro-bagging spree. We're hiking at a leisurely pace on this high plateau and on pathless terrain. The two Munro summits of Sgor Gaoith and Mullach Clach a'Bhlair are our goals and we may take in some other summits. 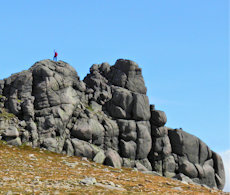 Bynack More is an intriguing Munro in the Cairngorms with a rocky summit and weird volcanic tors. 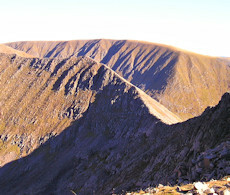 At the eastern boundary of the main Cairngorn massif, this mountain sits detached and as such gives splendid views over the other Cairngorm mountains. We'll be hiking over this mountain, perhaps taking in another peak or two while spotting wildlife. We're hiking and scrambling onto the high Cairngorm plateaux, bagging 5 Munros, and, just for fun, we'll be taking an easy scrambling route up Fiacaill Ridge up to Cairn Lochan. Vast plateaux, famed corries and impressive cornices, Creag Meagaidh and the neighbouring of Munros have it all ! We're spending a couple of days hiking in this area, bagging up to 5 Munros. 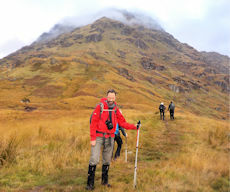 The majestic peaks in Rough Bounds of Knoydart are wild and remote from civilisation. 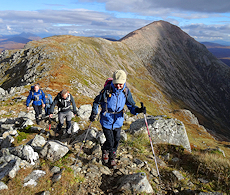 Spend 3 days hiking with us over ridges taking in 5 Munros and possibly more ! We're scrambling up 'Curved Ridge' on Etive Mor, probably the most well known rock-scramble in Glencoe after the Aonach Eagach. The difficulties are never too sustained and the views are exhilarating ! 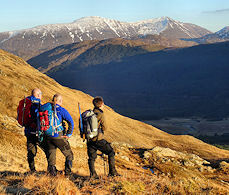 Over a weekend hiking we'll be bagging 7 Munros on the famed high peaks above Glen Shiel. 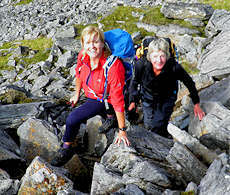 Steep slopes lead us up to spectacular ridges and rough summits with astounding views. The grand and complex cliffs and buttresses of Etive Mor, Etive Beag and Bidean nam Bian tower over Glencoe. We are here for a 3 day adventure exploring these impressive mountains and bagging 6 Munro summits. Two days of biking and hiking up high mountains and vast plateaux in the Eastern Cairngorms. Hike through delightful forests enriched with wildlife and scramble up weird volcanic tors to reach superb vantage points. 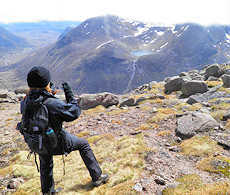 Over 3 days, we're in the mountainous and rough areas around Glen Carron and Glen Torridon, walking in remote and beautiful scenery, and scrambling over rough rock - a fine taster for those thinking of heading to nearby Torridon at later dates ! 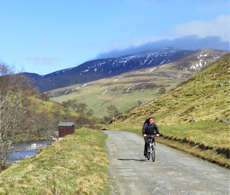 Two days of biking along fine tracks to reach the foot of remote mountains, from where grassy slopes lead us up to Munro summits with panoramic views over the Perthshire Hills and Cairngorms. A fine day of hill-walking over the 3 Munros summits that form the mighty Beinn a'Ghlo that rises up above Blair Atholl in Perthshire. A private road through a quiet national nature reserve with abundant wildlife, leads us to hidden mountains, 5 of which are Munros. 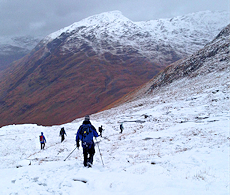 The Arrochar Alps form a cluster of rugged peaks west of Loch Lomond. 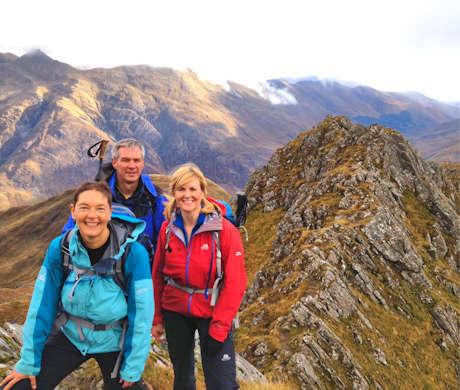 There are 4 Munro summits is this group waiting to be hiked up and we're aiming to bag these along with others, perhaps including the famed 'Cobbler'. Lying between Laggan and Alder, the Ardverikie Forest is a wild area containing three Munro peaks. We're hiking in this remote area, bagging the peaks. There are some vast plateaux to explore and we'll discover a white beach to chill out on ! We're in the rugged area west of the Great Glen, hiking from Kilfinnan up to Sron a'Choire Ghairbh and Meall na Teanga - the two Munros that stand high and impossing above Loch Lochy. We may even extend the day to include nearby Ben Tee.